Noke Smart Padlock and U-Lock Reviews | Is It Worth the Price? A few weeks ago we ventured down to Las Vegas for the ISC West convention hoping to uncover some new and exciting security products. We stumbled upon the Noke (pronounced “no key”) smart lock and were immediately impressed with this revolutionary rethinking of the ordinary padlock. We bought one on the spot, eager to get home and test it out. Overall, we think that with a few minor tweaks, Noke is going to be a game changer in the industry. We’ll cover prices, features, and functionality as we review the Noke smart lock. Summary: We love the concept, idea, and potential that Noke has to offer. 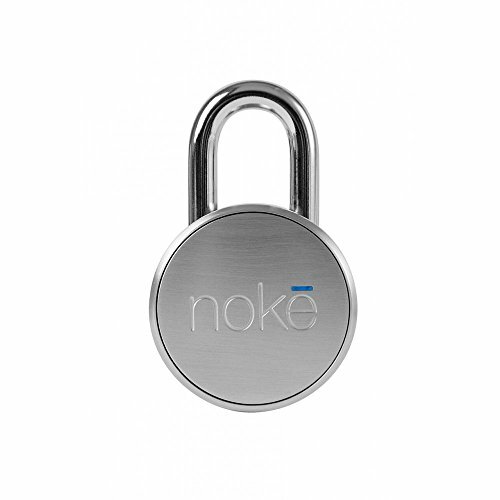 We think this is a fantastic product that will eventually be a game changer in the padlock industry; however, we do think that there are a few software tweaks within the app that could help propel Noke from a cool gadget to a must-have security item. Noke has developed two smart locks to choose from: the padlock and the U-lock—both of which use Bluetooth technology to pair with your smartphone, allowing you to access the lock in a number of different ways. The main differences between the two are in functionality rather than technology. The U-lock is a larger U-shaped design, intended for bike use, whereas the padlock can be used almost anywhere. The Noke padlock is similar to any other standard padlock with a few key differences (pun intended). The first such difference is the smooth lock face bearing only the Noke logo where you would normally find a keyhole or combination. Because it’s a smart lock and doesn’t need to worry about incorporating an analog locking mechanism, it can get away with a sleeker, more modern design. The outer shell is made from brushed stainless steel that protects all its internal digital components. Inside Noke are all the buttons, sensors, and batteries protected by silicone O-rings that keep water, mud, and other outside elements from damaging the internal components. Noke provides multiple options for accessibility rather than just using a key or combination. Key fobs, quick-clicks, Bluetooth recognition, and mobile access are all options for unlocking your padlock. Size: 3.3 x 2.15 in. The Noke U-Lock is available only on Noke’s website. The U-Lock uses the same technology and features as the padlock but also has an alarm that sounds after three seconds of a potential thief shaking or incorrectly entering a quick-click combination four times. The alarm sounds at 120 decibels, which means it can be heard up to 50 meters from the U-Lock. We really like the idea of having an alarm built in to your bike lock; however, the alarm kills the battery life significantly. A battery that would normally last five years will deplete in six months with the alarm enabled, even if the alarm never goes off. Battery: Rechargeable; 5 years standard, 6 months with alarm enabled. Size: 11.5 x 6.85 in. or 8 x 6.85 in. Noke also offers something called Noke Enterprise. Enterprise isn’t a lock but two separate services; Enterprise Web Portal and Noke SDK (Software Development Kit). The web portal will allow you to easily modify access schedules, grant access, and revoke access for a group of users vs scrolling through lists of users to make changes. You’ll also be able to track usage and have more advanced reporting. The web portal is currently in development and will be available in limited beta soon. Noke SDK comes with a one-time setup fee of $99 and is available for iOS and Android, and will be available for Windows shortly. What’s perhaps the most appealing thing about the Noke smart lock is that it gives you multiple options for unlocking your lock. Each option relies on a digital signal of some kind, which means you are reliant on battery power at the very least—even the quick-click ability relies on battery power—but the digital format allows for both convenience and security. The fate of Noke rests on the app and so far it has received mixed reviews on all platforms, including iOS, Android, and Amazon. The app allows you to name each lock and keeps them organized on the main screen (right). We foresee this as being extremely useful for someone who owns multiple storage units or lockers, or has other needs for multiple locks. Also, a property manager could benefit greatly from organizing all their locks within a single app and allowing access to tenants and workers accordingly. Diving into the app itself, we begin to understand why the reviews are so varied. We tested the app on both iPhone and Android, and Noke in general seems to be heavily geared towards iOS users. Android is notably missing the 2-Step accessibility option (see below) and seems to struggle connecting with Noke more than iOS does. There are also some redundancies in navigation. Separate tabs exist for Users, Fobs, and Activity on the main screen. However, these same tabs can be found within the Activity tab itself, making navigating the app a little confusing. The good news for Noke and its consumers is that these issues are software-based, which can easily be updated and tweaked. If it were hardware issues we’d be more hesitant in switching from a standard lock. Make sure to select “Remember Me” as you set up your account within the app or you will have to sign-in again each time you try to access your Noke lock. 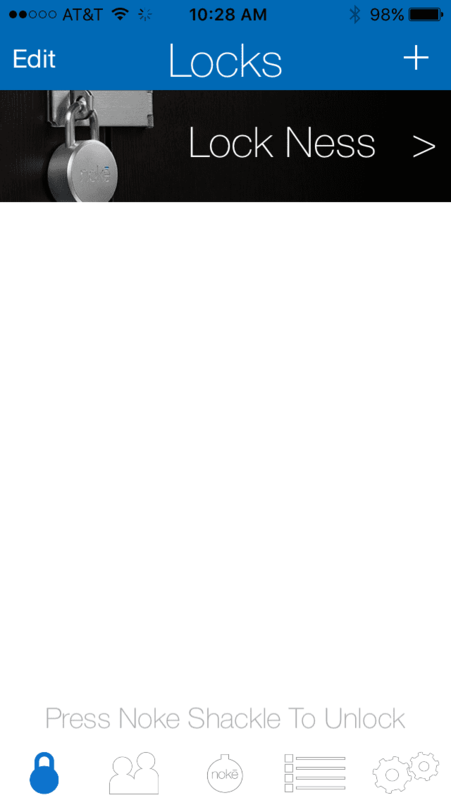 1-Step Unlock– After you click the padlock shackle, signaling your Noke to search for your smartphone, your Noke will automatically unlock when it connects to your device via Bluetooth. 2-Step Unlock– Instead of automatically unlocking after you click the padlock shackle, an “unlock” button appears in your Noke app and you have to press it from your phone before you can access your Noke. Two-step unlock is not available on the Android app, which is a little confusing to us. We feel like the 2-Step option is the more secure of the two choices because it requires an extra step. We’re not sure why Noke developers would leave it off the Android version. 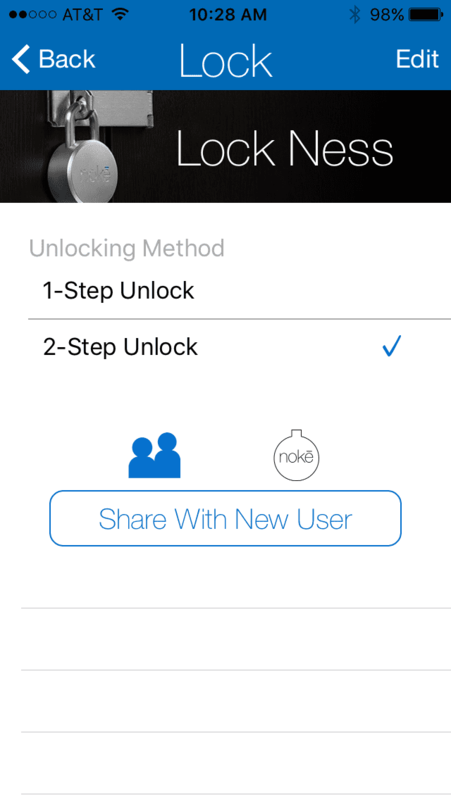 The Quick-Click feature makes it possible to unlock your Noke even if you don’t have your smartphone near. 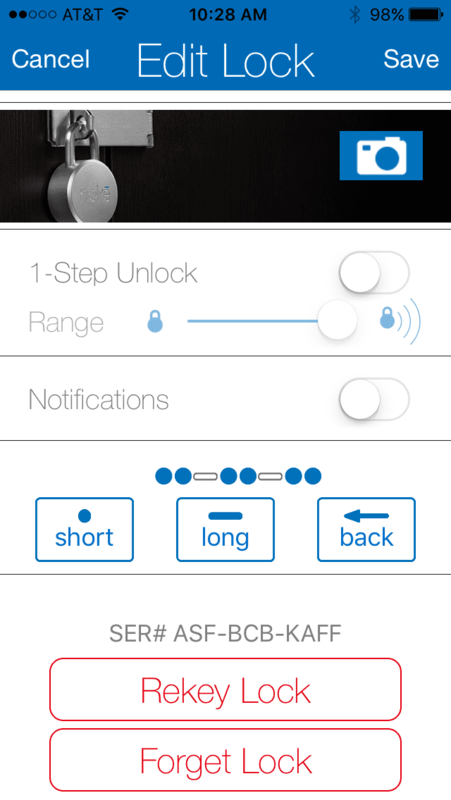 By programming in a series of short and long clicks on the shackle—think Morse code—you can unlock your smart lock without your smartphone or key fob. The quick-click took a little getting used to, and we can see potential problems if you don’t practice it or allow your Noke to reset after entering an incorrect code—about a five-second wait time. But after we got the hang of it, we were able to open our Noke via quick-click every time. Noke offers a Bluetooth-enabled key fob that you can order from either Amazon or Noke directly. This is a great option for someone without a smartphone. Personally, we’re not as big on the key fob option, simply because it seems to be a step backward from the other truly innovative access options, but we understand having the option may appeal to some. We were unable to test a key fob ourselves, but like every other aspect of Noke, reviews are mixed. Some concerns have been raised that the key fob does not work if you have your phone with you. The Noke padlock uses a 2032 coin cell battery—view on Amazon—that Noke says will last up to one year. With the product as new to market as it is, there is little information available on whether the battery life lives up to that claim; however, we have no reason to believe otherwise. What we really like about Noke is its Jump Start feature. The unique challenge a smart lock brings versus a traditional padlock is that you suddenly have to worry about how you’ll access your lock if the battery dies. Noke designers developed a clever workaround called Jump Start to solve this inevitability. Jump Start allows you to press a replacement battery against the contact points—beneath a protective cap—on the bottom of the padlock. This way, your Noke gets enough power to allow you to unlock it and replace the battery. Imagine you’re at the gym and you are using your new Noke lock to secure your stuff in the locker room. You have your Noke set to one-Step Unlock because you like how it automatically registers your smartphone and unlocks when you click the shackle, but you forget to switch the setting before you lock your phone in your locker while you work out. Anyone who comes by and clicks the shackle will now gain access to your locker. Now, I understand that Noke is not responsible for reminding you to switch your Noke setting, and I’m not offering a solution, I’m simply pointing out a vulnerability. But is it really better than a traditional padlock? Noke’s hardware design is truly impressive. The hardened steel shackle prevents anything but heavy duty bolt cutters from getting through, which is the case for any padlock, digital or traditional. What I really like is the added security the digital lock provides. Traditional lockpicking will not work on a Noke. The only drawback for me at this point is the mobile app. So is Noke better than a traditional padlock? I think it will be, with a few software tweaks. I have really fallen in love with the Nokē lock. There are certain small areas that could be improved upon (I’m a graphic designer by trade and I tend to nitpick the design of the app), but the product overall is solid and well tested. I did have an issue with my first one where the mechanism was failing to release the lock. However I contacted the company and was issued a new lock and received it the next business day. I would say their customer service more than makes up for any technical hiccups that I have experienced. It should be said that my new Nokē works like a dream. I am very satisfied with this product and would highly recommend it. M. Flick January 19, 2016. Amazon reviews. I bought mine through Kickstarter. The app is easy to use I backed this campaign and bought a three of the locks. I sent one of them to My son at the Air Force Academy. He loved the lock and said it was cool. It does what it is advertised to do. For someone with MS. it a great help to not having to fumble with a key.This is lock is a huge step in the convenience of padlocks.They are sleek, solid and well designed. A real quality product. The makers of this lock really took the time to make a solid lock and a polished app. If you’re looking for a secure padlock style lock that is capable of unlocking via Bluetooth or manual taps as well as sharing access, this is definitely something you want to check out. For people that fight with Locks like myself I would recommended buying a few of these locks. Mike Knox. April 1, 2016 Amazon reviews. The lock is unreliable — it works the first few times when I have the app open. But after 30 – 60 minutes I have to relaunch the app and still sometimes the lock doesn’t respond. It’s a great idea, but I’ll wait for v2 before I use one again. Ian March 31, 2016 Amazon reviews. I really do want to love this product but unfortunately the Android App is so damn buggy that it basically makes this lock useless. The app crashes, freezes, doesn’t remember passwords and now has completely locked me out from my account making the lock a paper weight. It is a great idea and solid craftsmanship for the lock which is why I gave 2 stars but the android app has serious problems which should of been fixed before you launch a lock that needs an app. I have tried contacting support but still no word so hopefully they will get back to me soon. Would love to have this function as it’s supposed to but am losing hope and most likely just have an expensive paper weight now..ughs. Shonn Slivkoff April 26, 2016 Amazon reviews. With Noke, we feel like we’ve got one foot in the pool. We love the concept, idea, and potential that Noke has to offer. 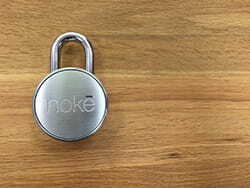 We think this is a fantastic product that will eventually be a game changer in the padlock industry; however, we do think that there are a few software tweaks within the app that could help propel Noke from a cool gadget to a must-have security item. While the hardware is sound, the app could use a little work, especially on the Android side of things. Overall, $69.99 feels a little steep for something that is “almost there”. However, we’ll gladly fork over the cash for a perfected Noke.